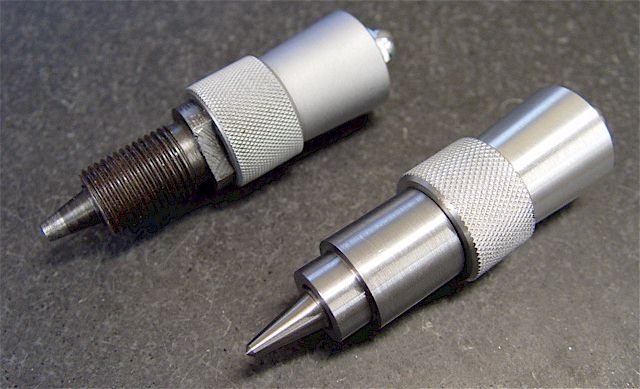 neutral, & left to right as well as enabling left-hand single-point thread cutting, if so desired. 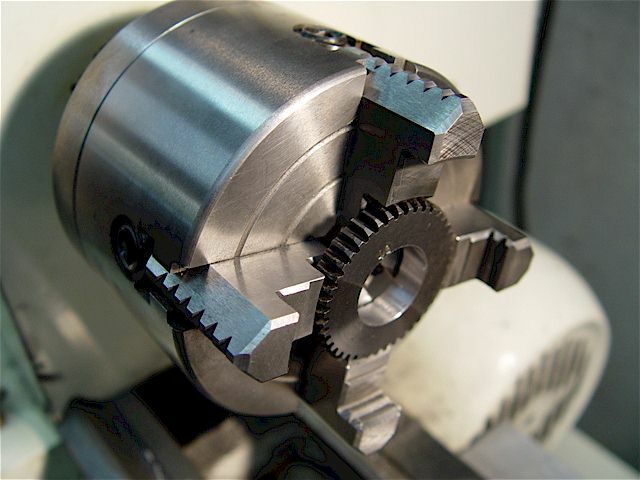 Tramming the gear in a four-jaw chuck. Mind the gap. 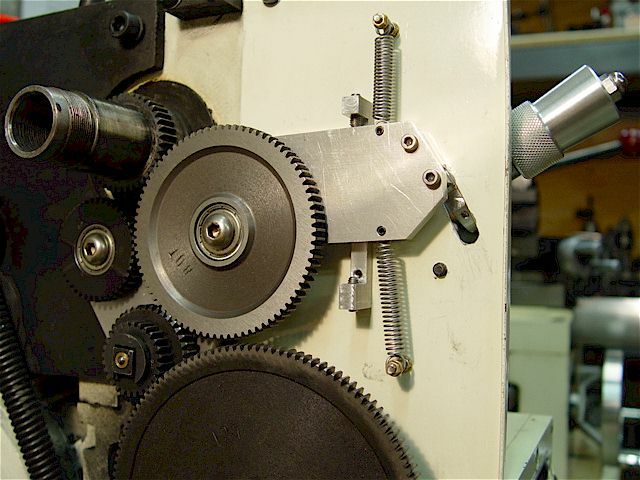 Opening up the gear's center with a carbide insert boring bar. Bored to exactly the same size as the bearing OD (0.8665") for a press-fit installation. 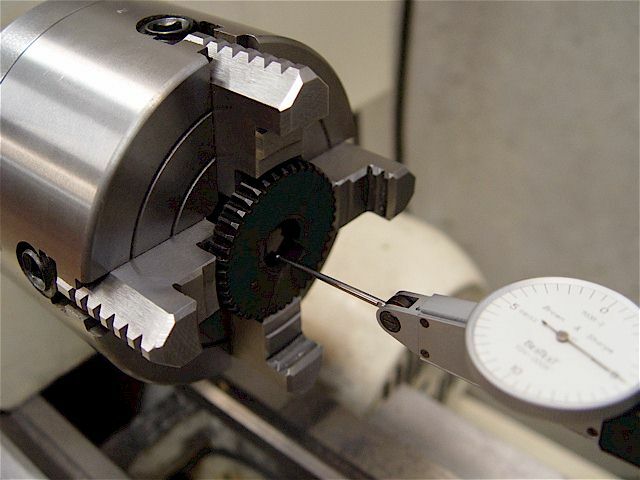 Telescoping inside gages & a micrometer were used to accurately measure the gear ID. Camper the edges to facilitate press fitting. 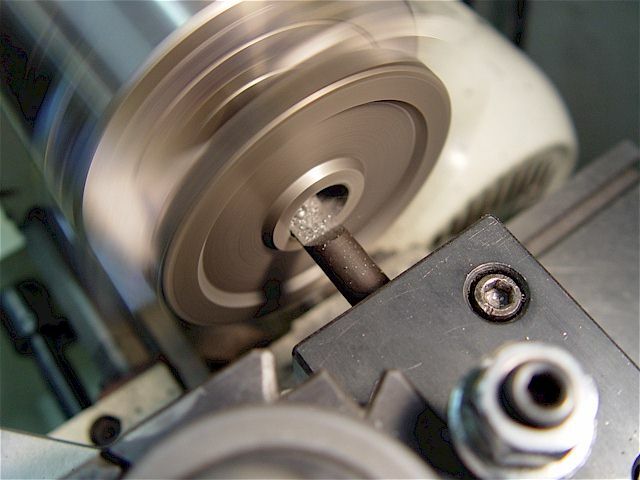 The bearing is 5/16" ID & 0.275" thick. 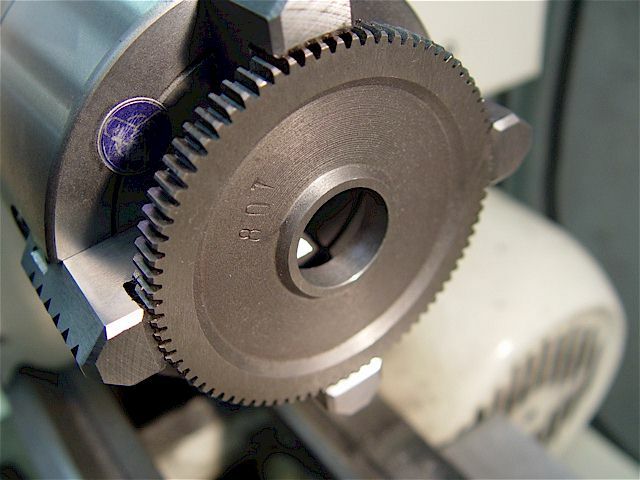 The same hole-boring procedure was used for the small gear. 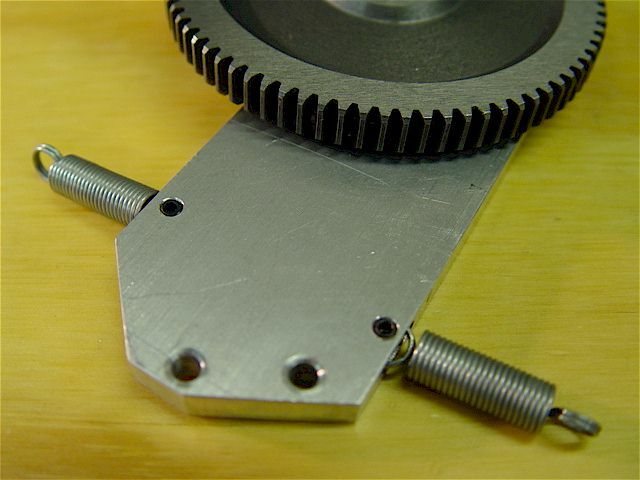 The bearing are pressed flush with the back surfaces. 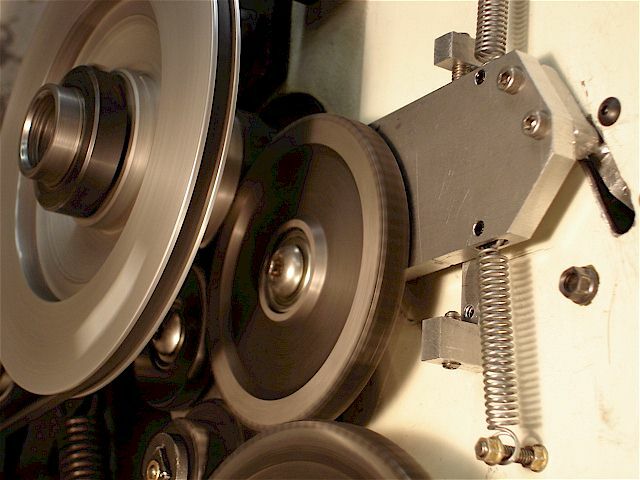 The large aluminum spindle belt pulley has been removed. This bolt had to be replaced with a flathead M8-1.25 making it flush to clear the gear subassembly plate. 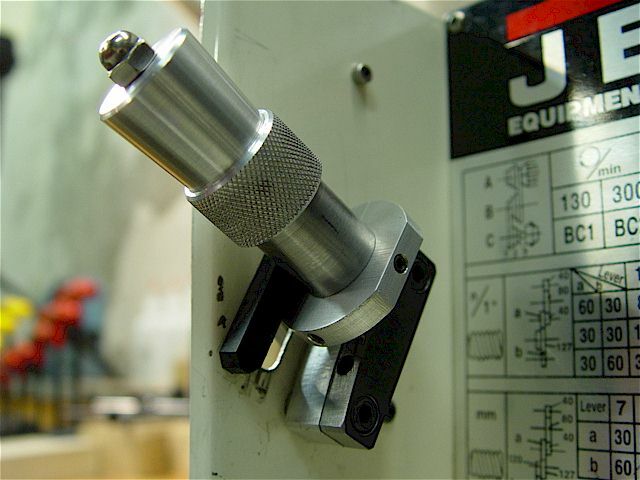 Countersunk the hole 90 deg & used a metric tap to clean out the threads. plate that fits your needs. 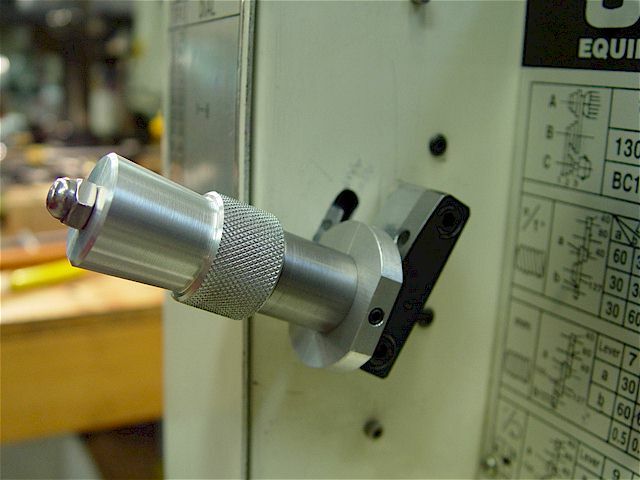 Machines vary in design, e.g., some machines do not have this type of spacer. 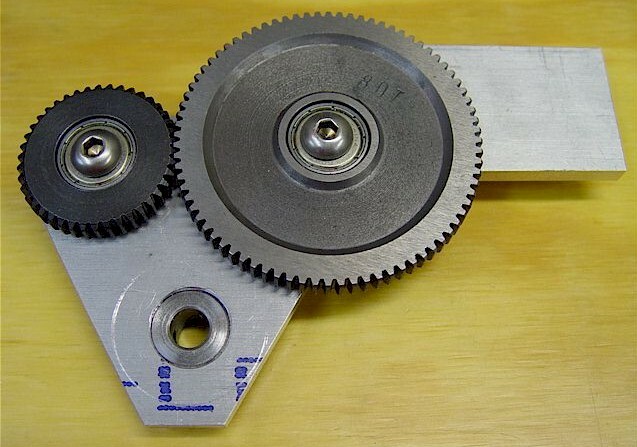 The plate pivots on the gear shaft using the OEM spacer ring which has been press-fit into a 25/32" hole. 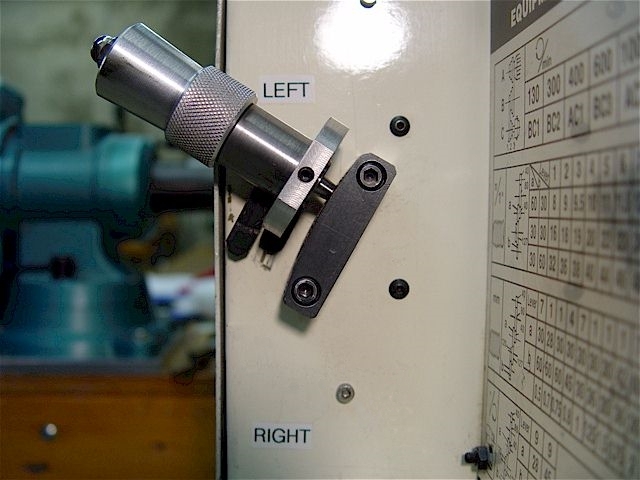 When the plate is positioned completely against the lathe, the spacer ring is not flush on the front surface. 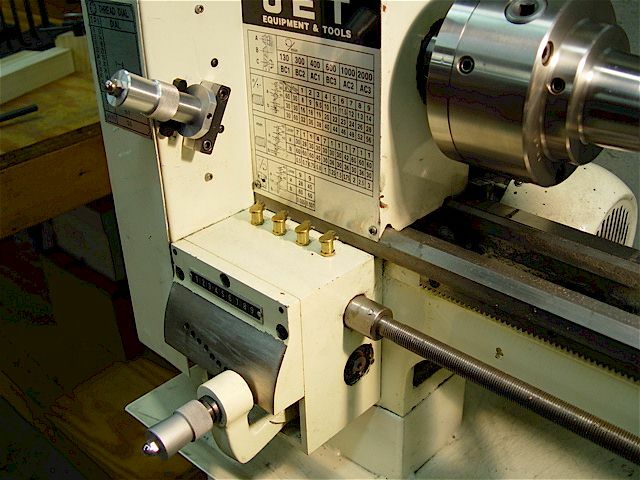 The OEM shaft (which threads into the lathe) & keyed bushing original functions have been retained. 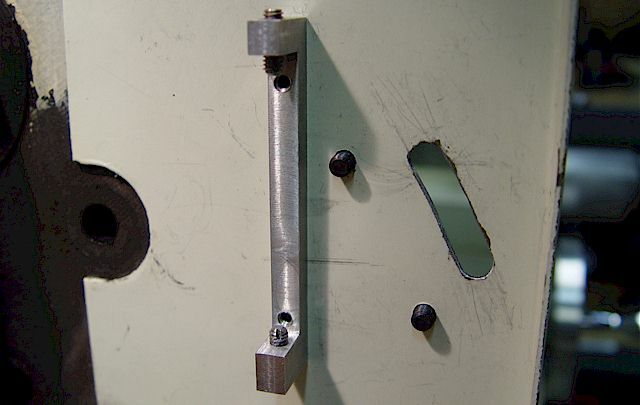 Note the flush flathead bolt to the left. 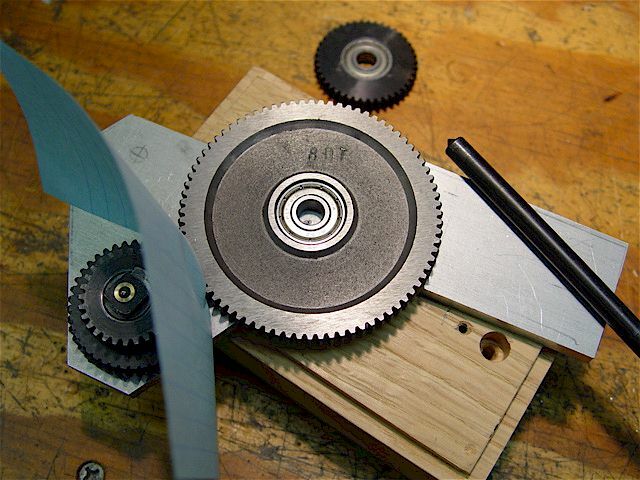 Placing several layers of paper in-between meshed gears before marking the centers can help set backlash. 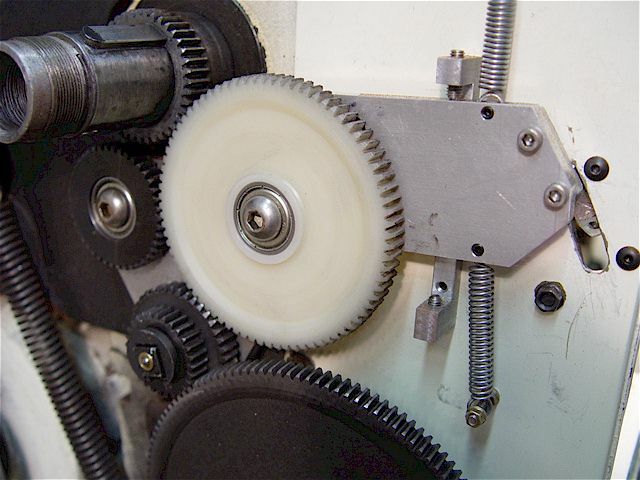 There should be a little backlash for the gears to spin properly. 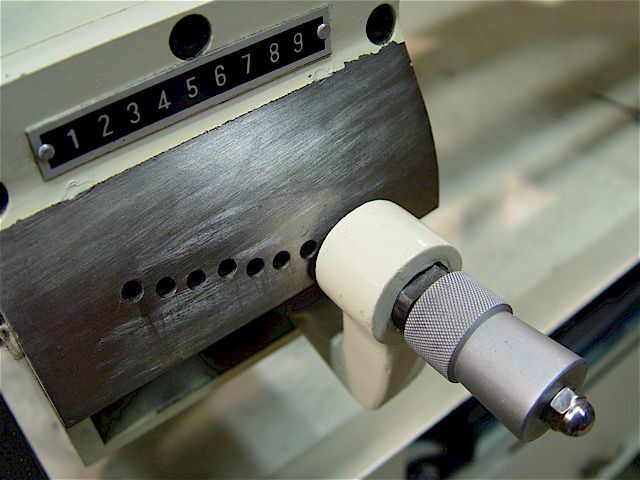 A 5/16" transfer punch marked the center. 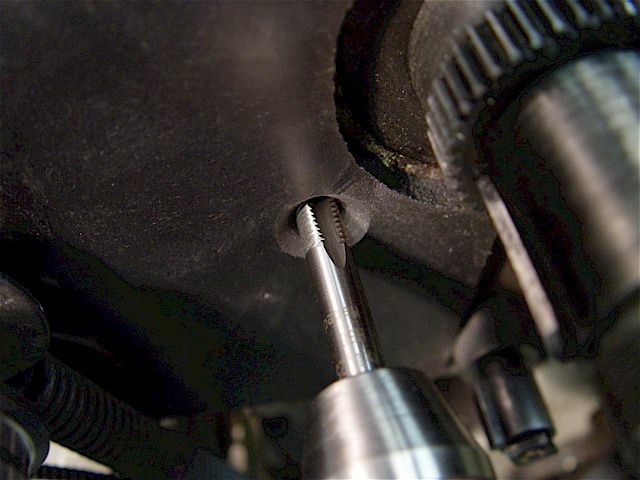 Using a hex tip & the live center chuck to steady a very short bolt held in a collet at 30 RPM. 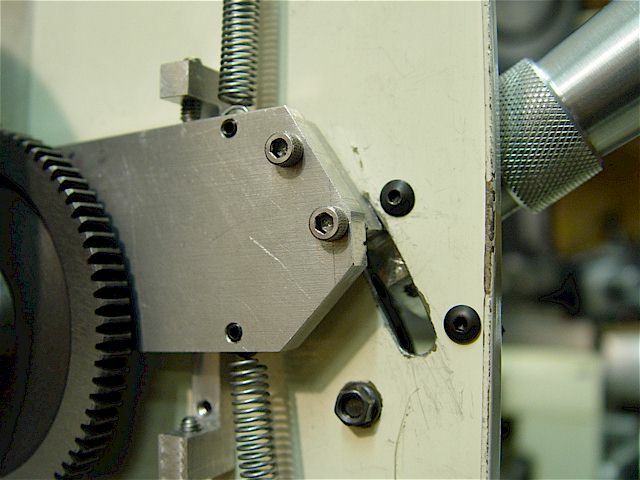 The turned down area allows for gear backlash adjustments. 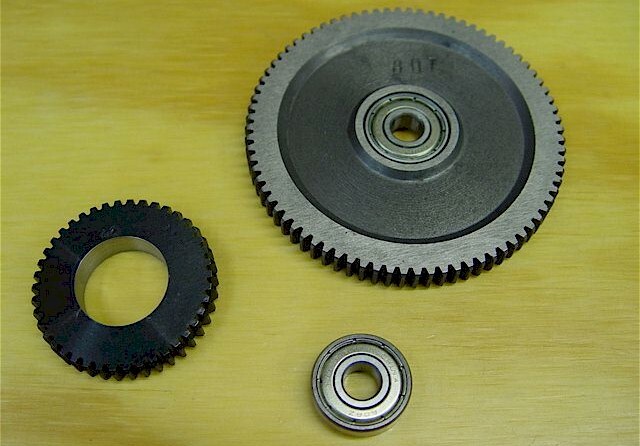 There is a washer that contacts only the hub under each gear to eliminate rubbing against the plate. 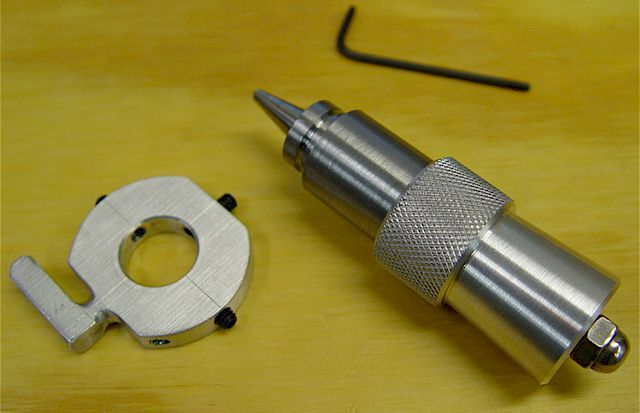 The SS 5/16-18 x 0.625" bolt clamps only the bearing's hub. 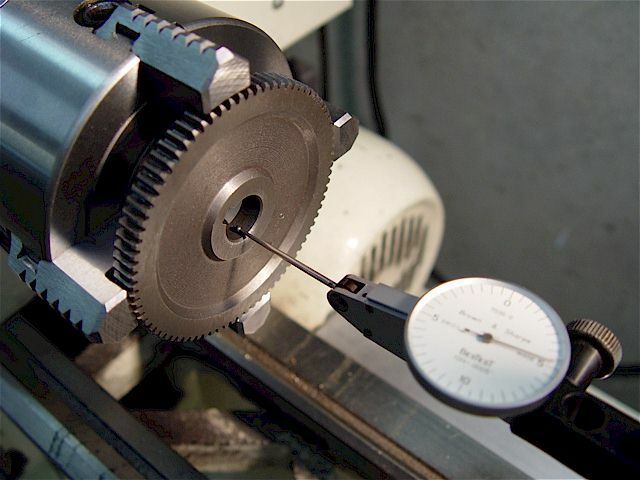 Select this gear size to match the pivot gear if left-hand threading is of importance. Spacing of the third gear affects the size of the neutral zone. 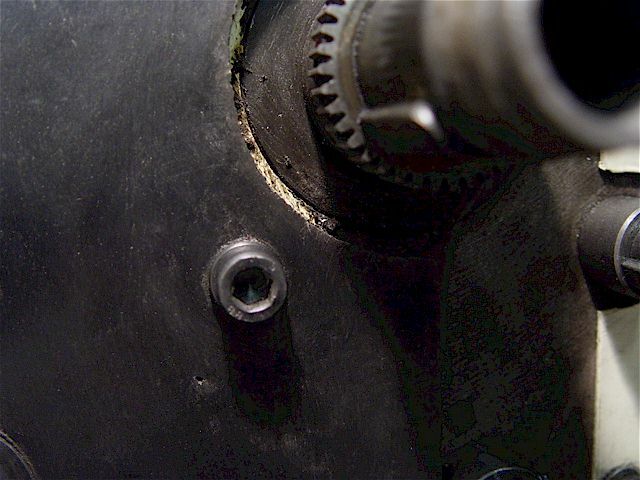 The screw threads that contact the hub have been turned down slightly to allow gear backlash adjustment. 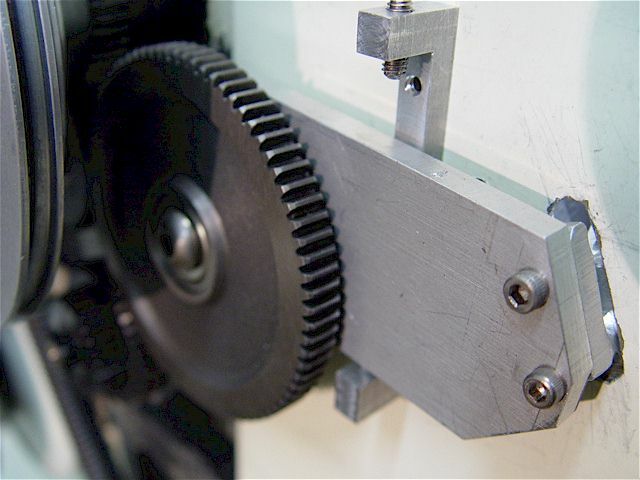 This bracket allows adjustment of the gears' backlash for both directions. 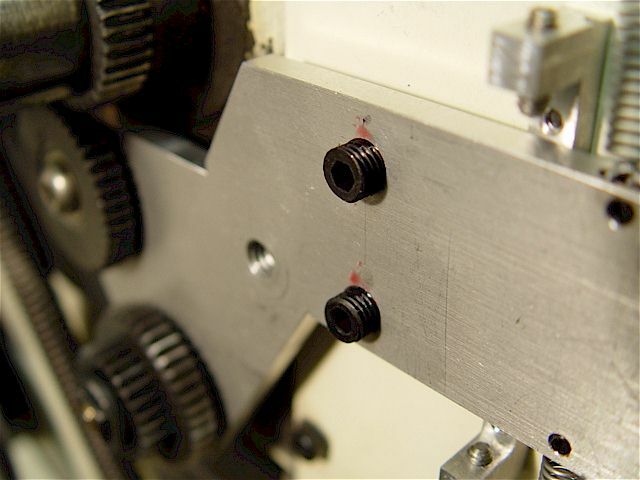 The set screws are 8-32 with nylon inserts. 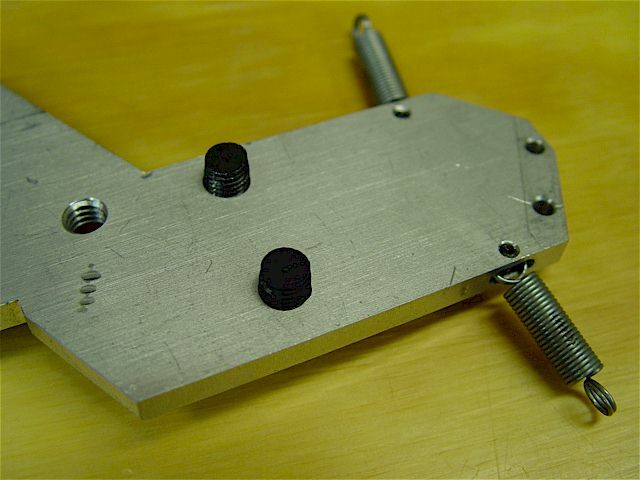 Bracket held with two 6-32 button-head hex screws. 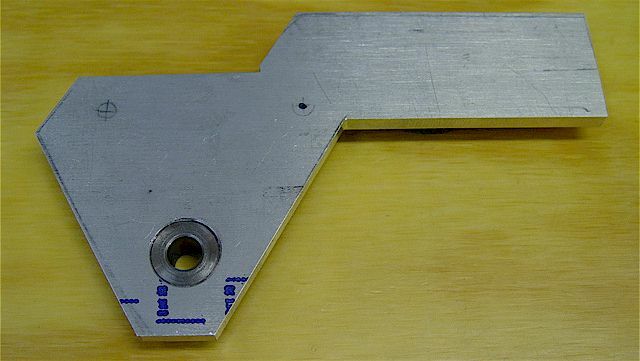 Note the radius slot for the control handle. 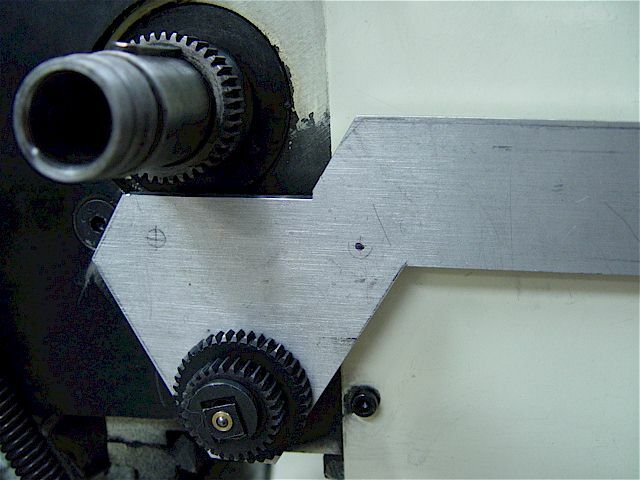 All gear backlash is set before marking the three detent positions on the steel plate. 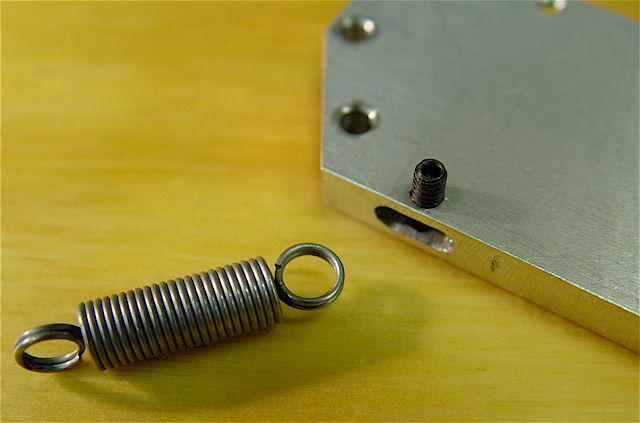 Two small 1/8" wide x 1/4" deep pockets were milled which use 6-32 set screws to hold the stiff springs in place. 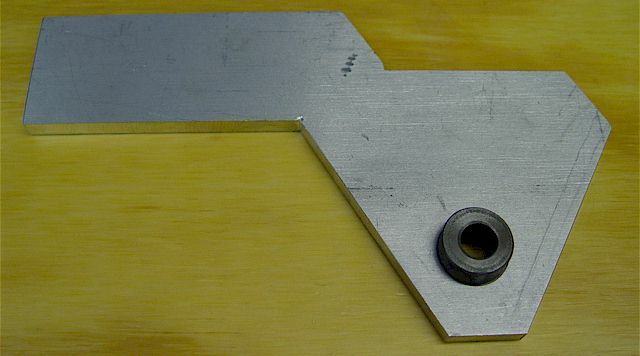 The two springs hold the plate in the neutral position. 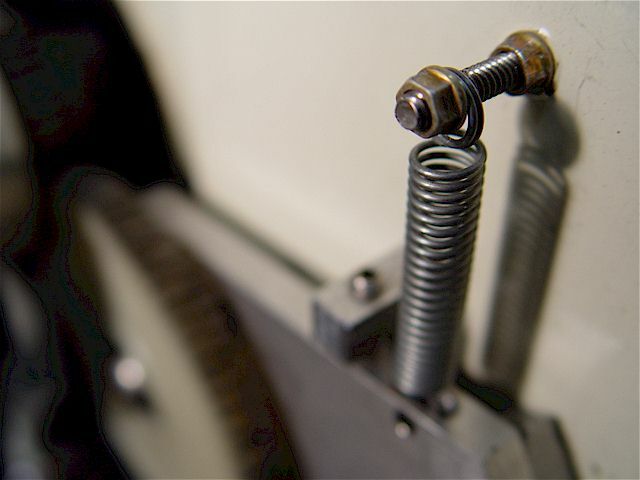 6-32 screws with lock nuts act as the spring anchor points. 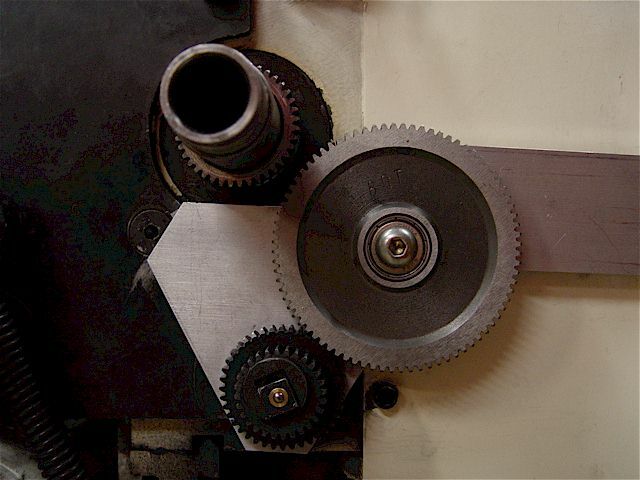 To stabilize sideways play, two 5/16-24 plastic set screws were threaded into the plate under the large gear. Note the red #271 Loctite added before setting the depth. 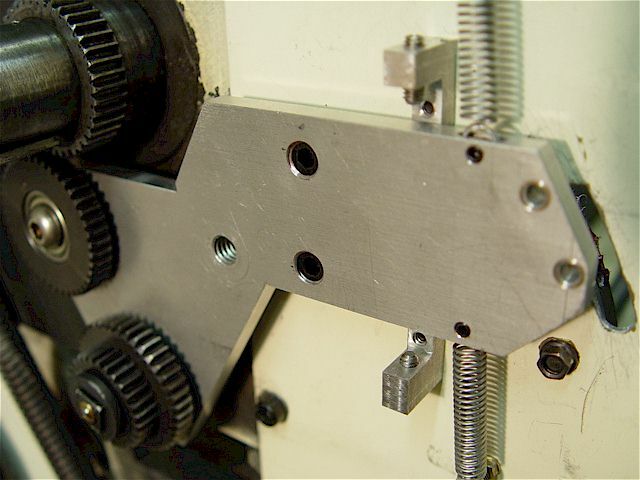 These flat-tipped set screws contact the inner lathe belt/gear housing. 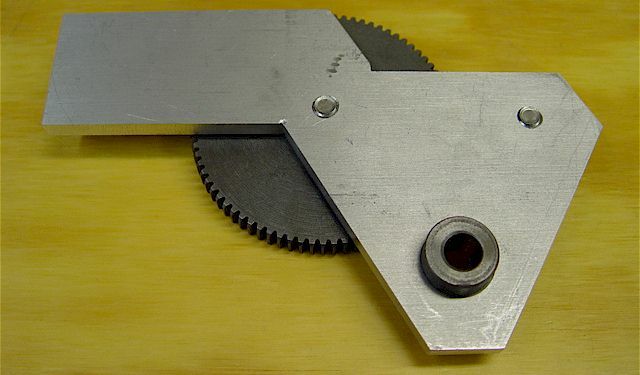 A Delrin spacer on the other side opposes this adjustable mechanism. 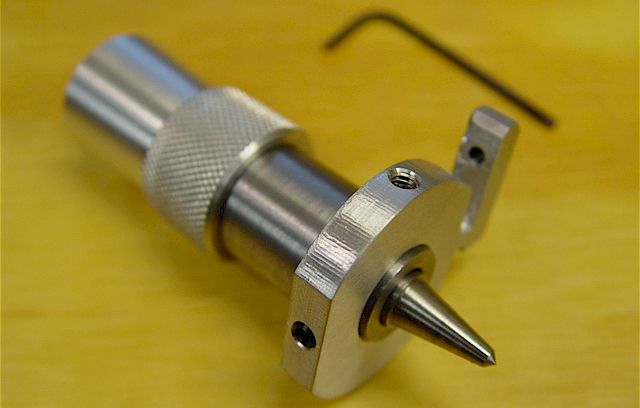 Opted to copy the detent mechanism that is used for the Jet 9x20 lead screw transmission. 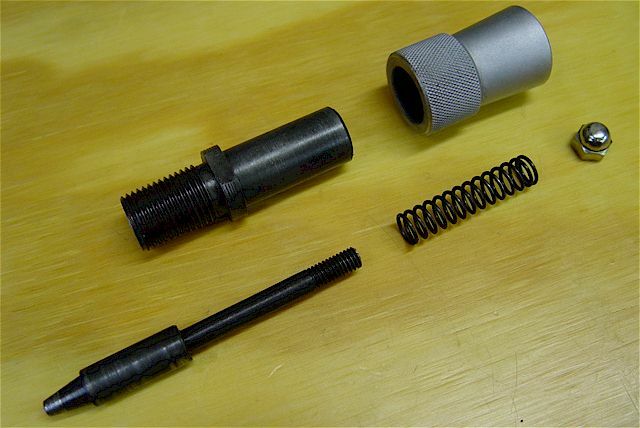 A 17mm wrench unscrews the detente body. The design is straightforward, all-steel, & robust. 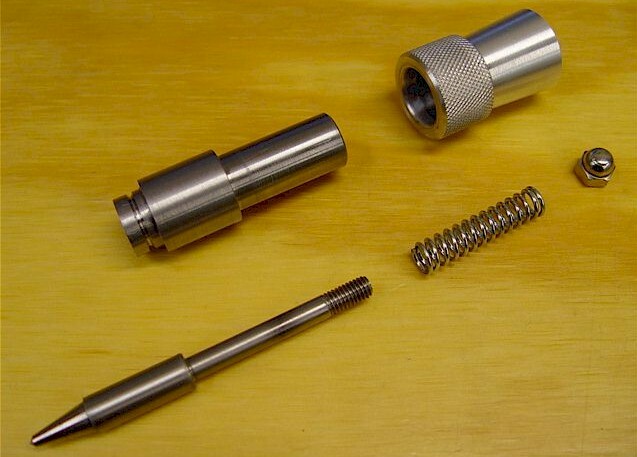 The spring is metric; 9mm OD x 7mm ID x 40mm long. The plunger & body are steel; the grip is aluminum. 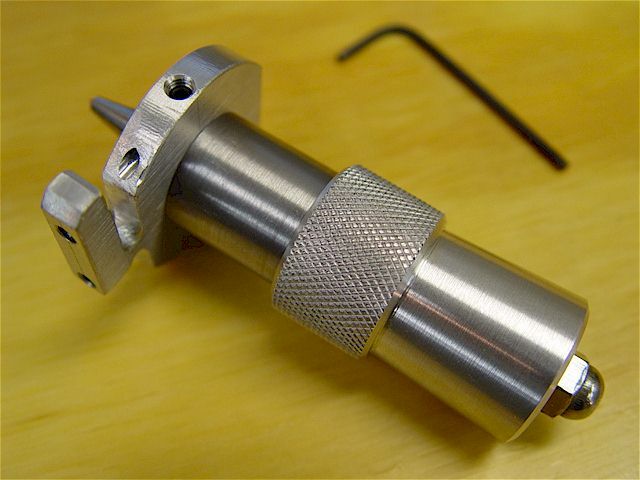 The tip is pointed to transfer the center to the detent plate. 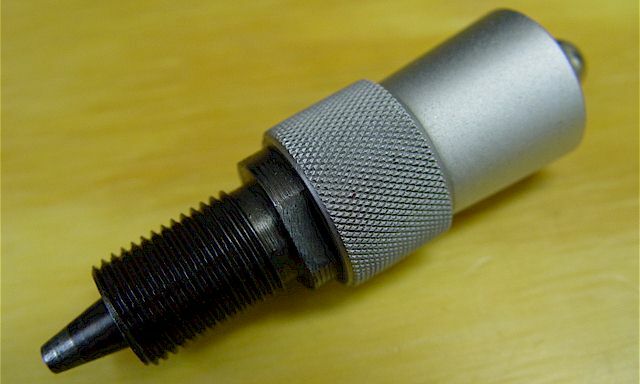 The plunger screws through the threaded top of the grip & the M6-1 chromed acorn nut locks it into place. 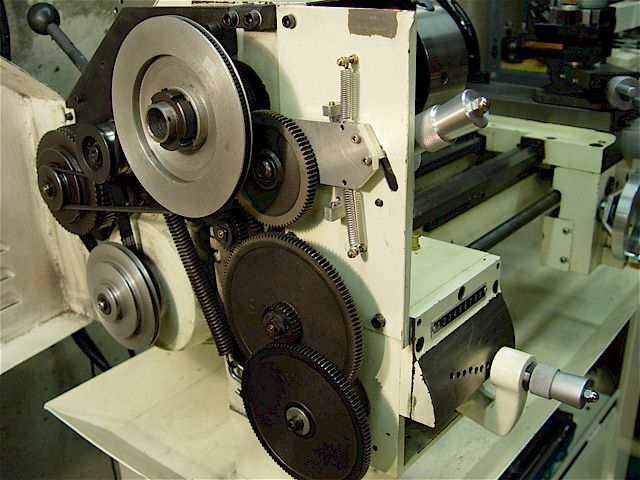 robustness of the lathe transmission mechanism. 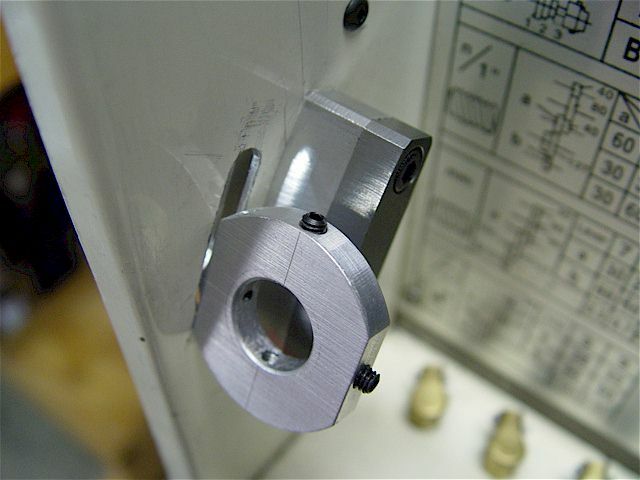 The new body end is sized to fit into a 5/8" precision reamed hole in a 1/4" thick aluminum plate bracket. 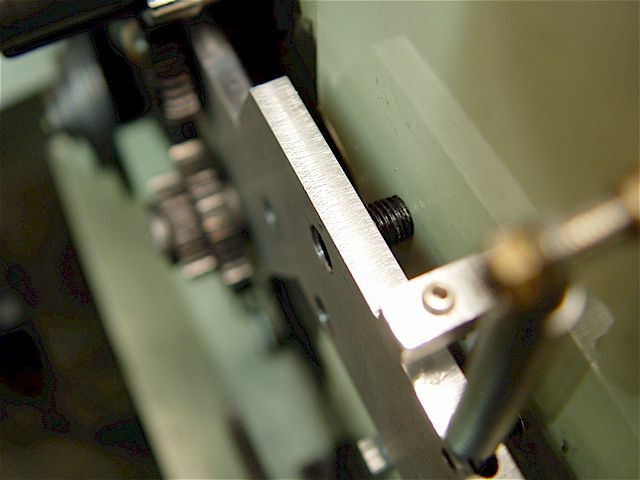 Fractional equivalents were selected to ease design, material selection & subsequent fabrication. 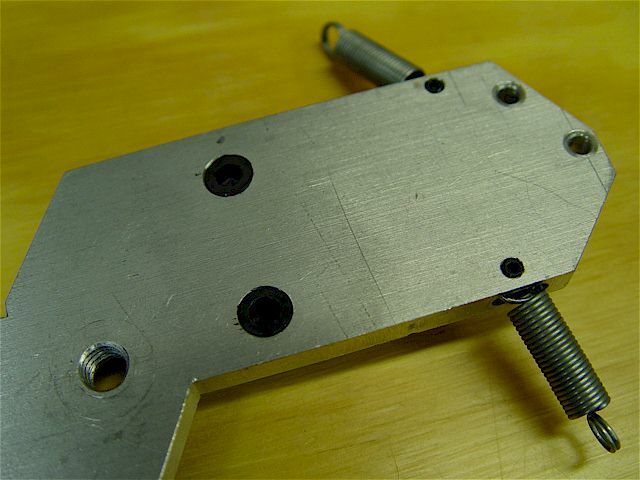 Three pointed set screws engage a V-notch to hold the detent mechanism body. 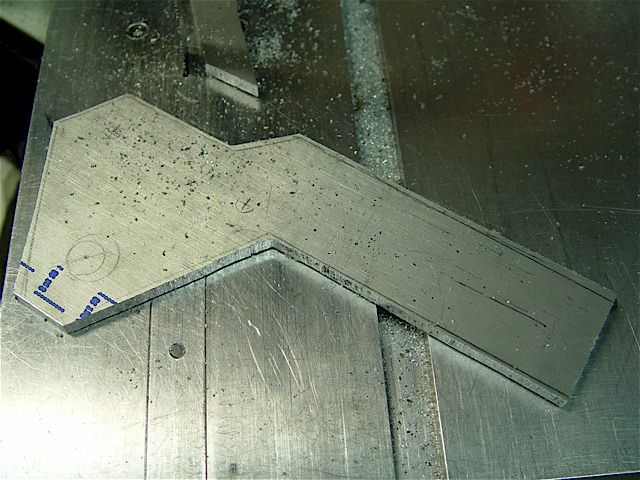 The bracket edge was milled using a rotary table. 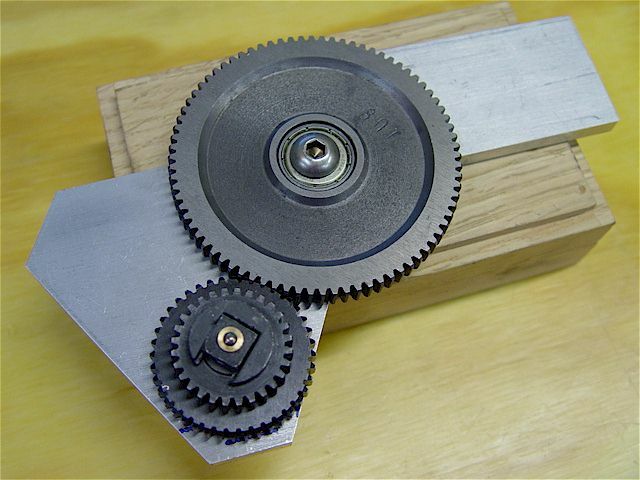 4.5" radius to match that of the gear plate. 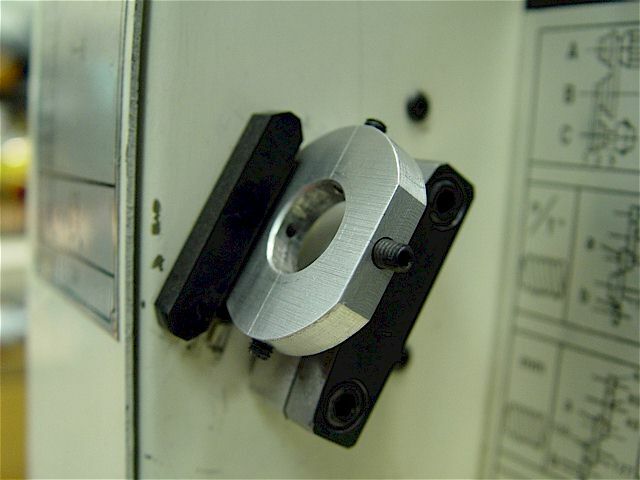 The plates were milled using a rotary table. 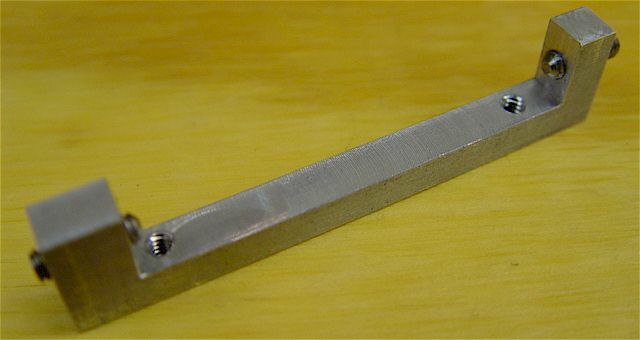 The lathe's steel sheet metal (0.063" thick) was tapped for the counter bored, 10-32 screws. over the surface. A dab of Red "N" Tacky #2 multi-purpose EP grease on the detent plate facilitates use. 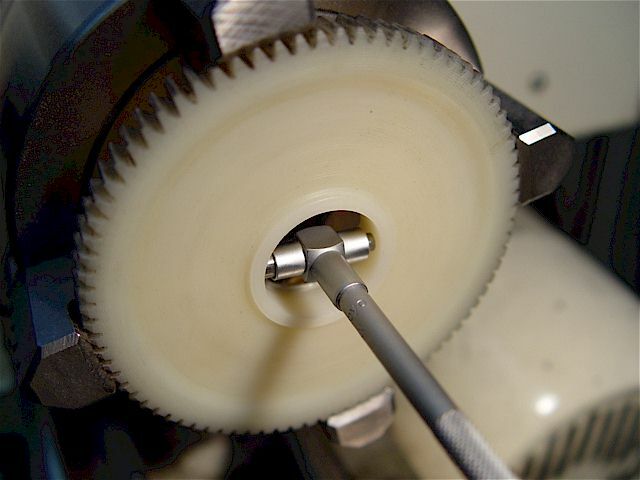 A lubricous Delrin spacer was added which rests against the detente body to complete the gear plate capture. All sideways play has now been eliminated thus greatly enhancing precision & control when shifting the gears. 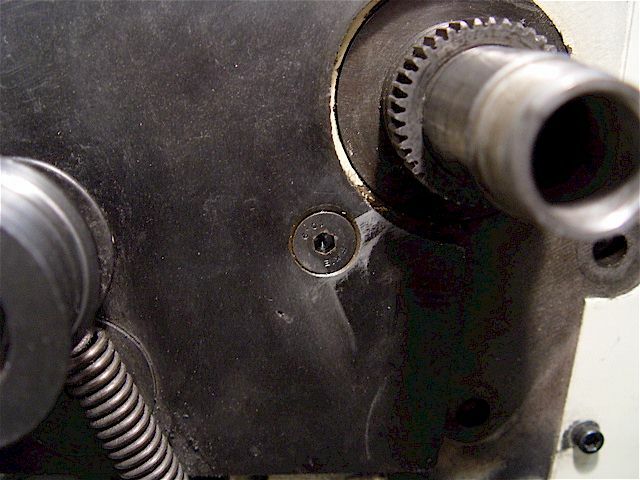 Two, 6-32 button-head screws hold the Delrin spacer; blind holes were threaded with a bottom tap. 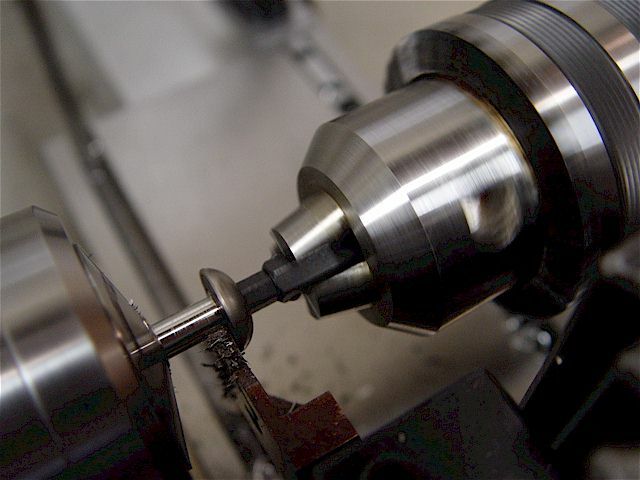 Anti-seize compound was applied to the spindle threads before screwing the locking ring back on. The two control handles essentially match each other. 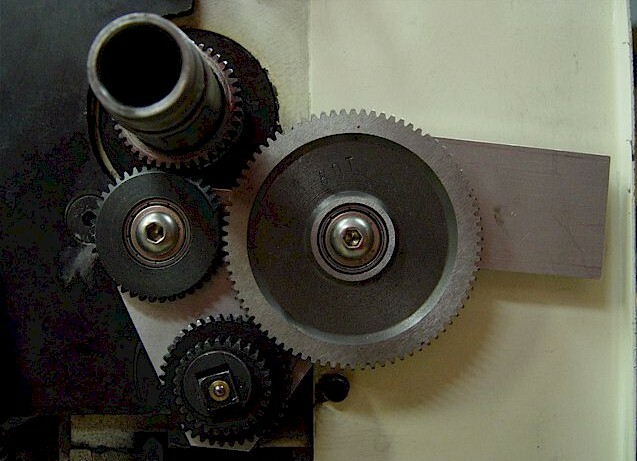 Click the photo for the tumble-reverse movie to see the three gear positions. 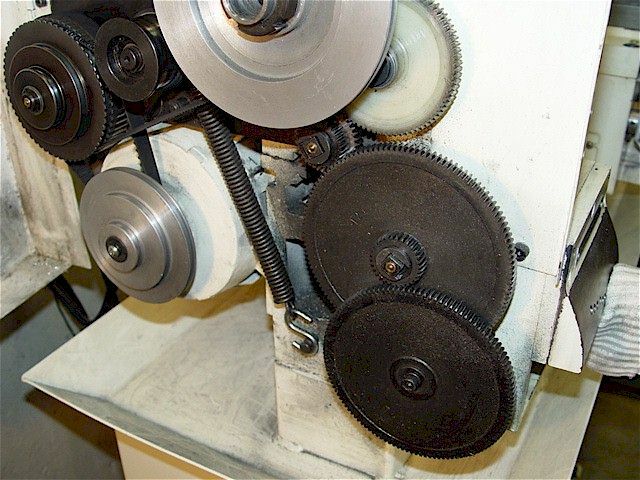 The lead screw moves the carriage right to left (lever up), stop (lever middle/neutral), & left to right (lever down). 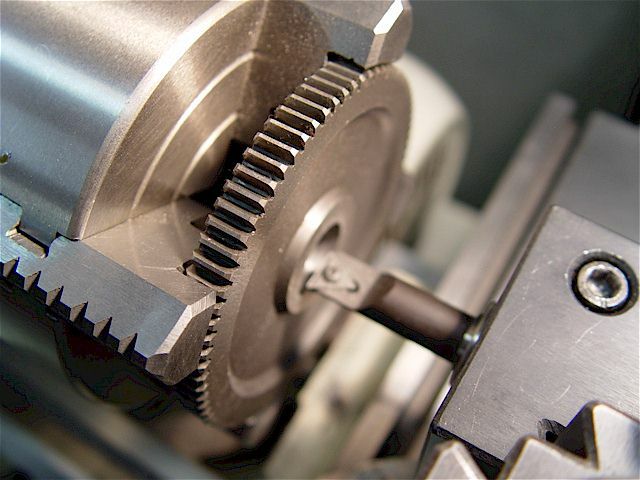 Gear teeth engage smoothest at the lower speeds. 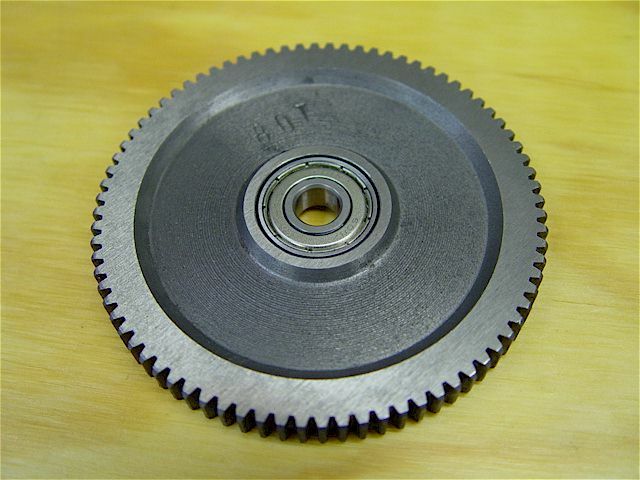 The 80T metal gear can be noisy at higher speeds so a bearing was put into the OEM plastic gear. 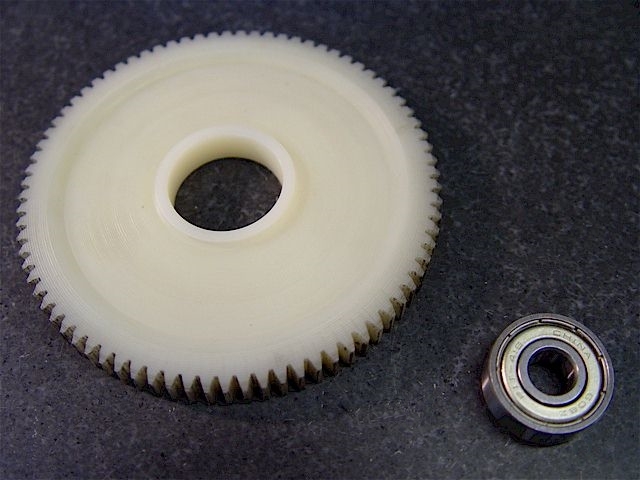 The nylon gear runs much quieter, shifts smoothly & retains a measure of safety for the operator. 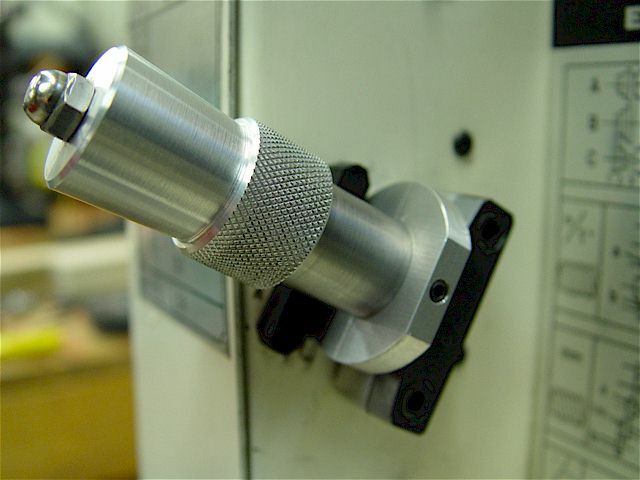 A telescopic gage being used to check the gear ID & update the X-axis DRO. 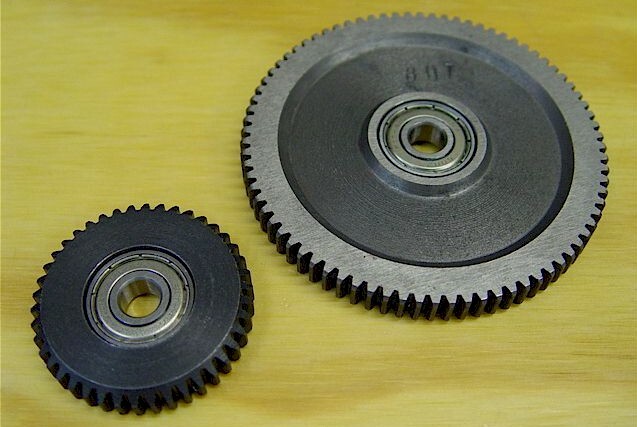 The extended hub was faced off to be the same thickness as the gear's edge. 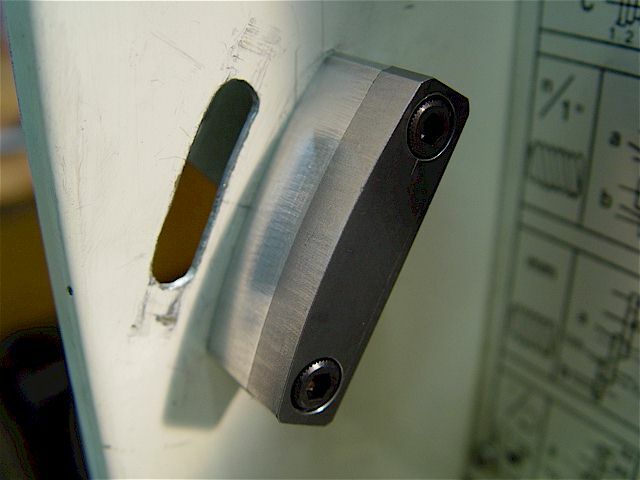 Permatex green penetrating grade thread locker was used to cement the bearing-nylon interface.